Location: The great marshlands east of Tharbad, around the lower reaches of the Glanduin River where it approaches its confluence with the Hoarwell, which thereafter becomes the Greyflood. Map of the Tharbad region, including Nîn-in-Eilph or Swanfleet, the Waterlands of the Swans. Next day they went on into northern Dunland.... [They] rode [northwards] at ease until they reached the Swanfleet river, and found the old ford, east of the falls where it went down suddenly into the lowlands. Far to the west in a haze lay the meres and eyots through which it wound its way to the Greyflood: there countless swans housed in a land of reeds. If the name Glanduin was remembered at all it would only be in Rivendell; and it would apply only to the upper course of the river where it still ran swiftly, soon to be lost in the plains and disappear in the fens: a network of swamps, pools, and eyots, where the only inhabitants were hosts of swans, and many other water-birds.... In The Return of the King VI 6 it is called the Swanfleet river (not River), simply as being the river that went down into the Nîn-in-Eilph, "the Waterlands of the Swans". 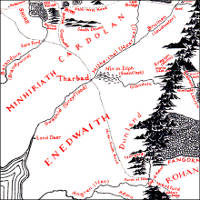 It was my father's intention to enter, in a revised map of The Lord of the Rings, Glanduin as the name of the upper course of the river, and to mark the fens as such, with the name Nîn-in-Eilph (or Swanfleet). 1 In the event his intention came to be misunderstood, for on Pauline Baynes' map the lower course is marked as "R.Swanfleet," while on the map in the book... the names are placed against the wrong river. nen 'water'.... Nîn 'wet' in Loeg Ningloron; also in Nindalf. Sindarin alph, a swan, plural eilph; Quenya alqua, as in Alqualondë. The Telerin branch of Eldarin shifted original kw to p (but original p remained unshifted). The much-changed Sindarin of Middle-earth turned the stops to spirants after l and r. The original alkwa became alpa in Telerin, and alf (transcribed alph) in Sindarin. 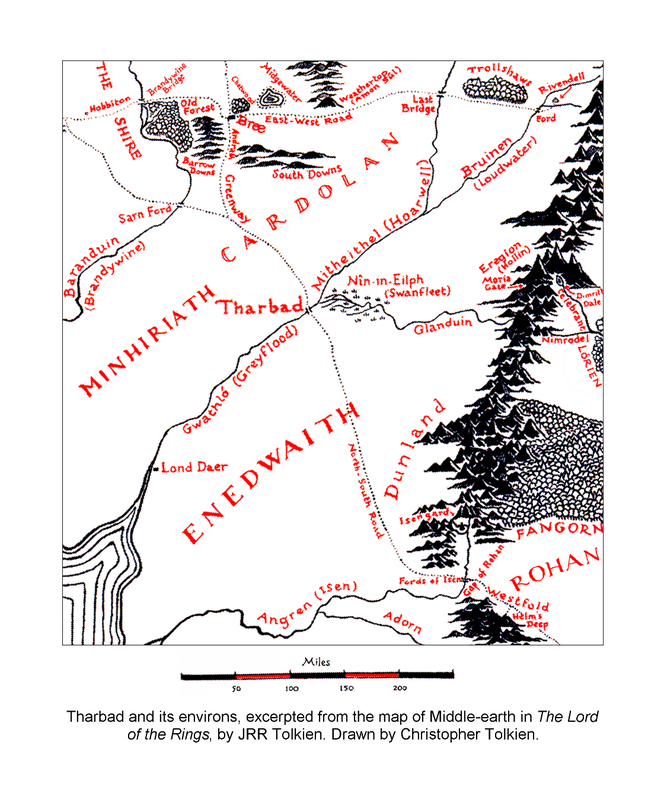 1 The map was in fact revised in the Fiftieth Anniversary edition of The Lord of the Rings, published in 2004.